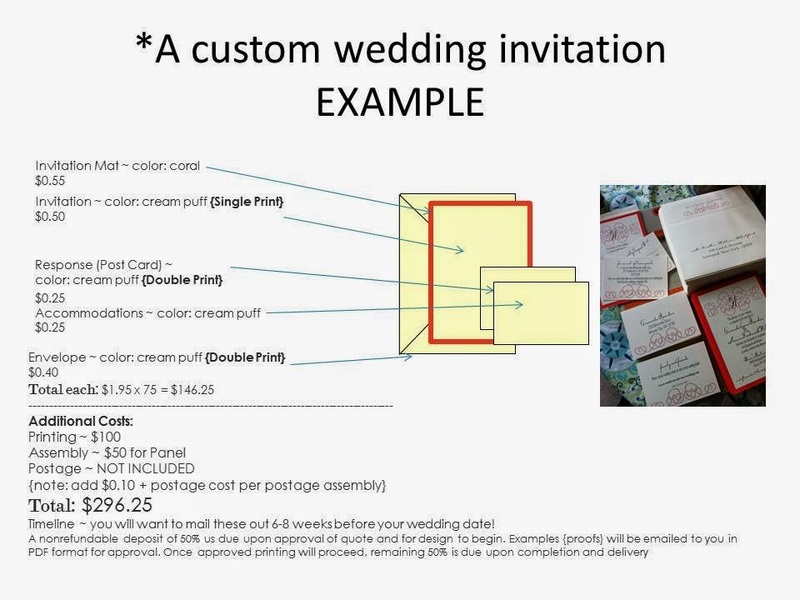 Are you interested in learning more about our full wedding invitation suites? Here is a quick glance at a few of our invitation suite examples. 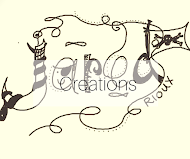 Colors, inserts, design, and embellishments are customized for you! 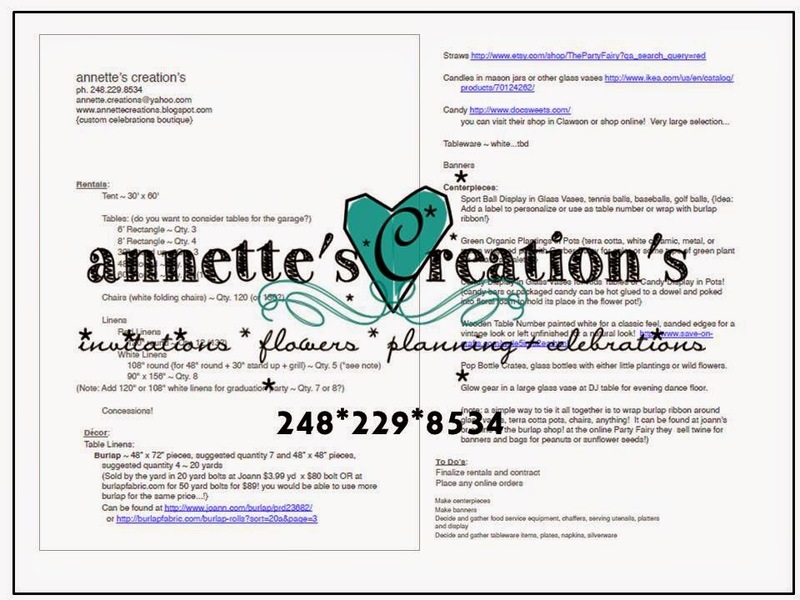 Our printing includes envelopes, return addresses and all! Other stationary is available to meet all your wedding paperie needs and are coordinated with your colors and design. OK, ready to see how it works! First take a look at our a la carte invitation menu! 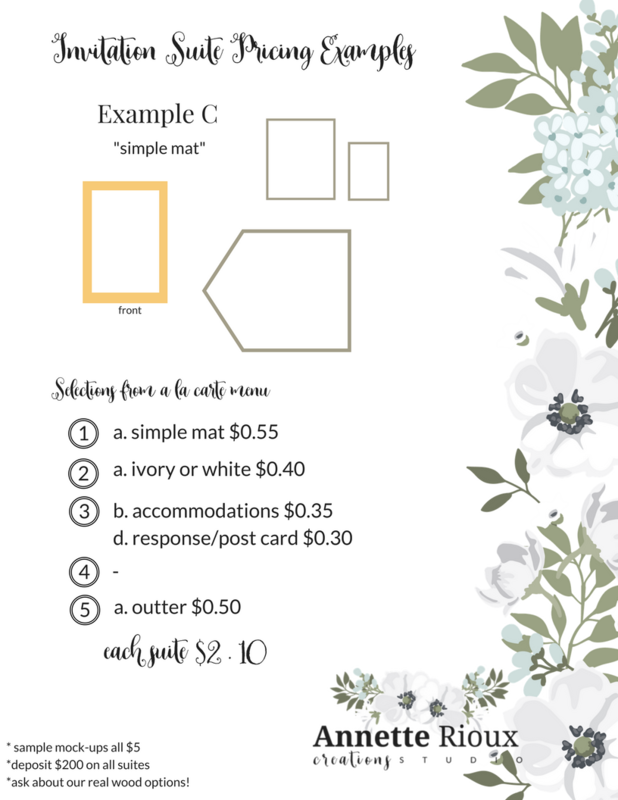 Walk through each step to create your perfect invitation suite. Not sure it all makes sense, that's ok, go ahead and jump to the pricing examples and see what fits your price point best and go from there! Ok, are you wanting to learn more and how to piece it together? We have a few examples of suites we do often to give you a better idea of what an invitation suite costs. This suite is stunning, all the pieces fit together neatly into a nice little package, easy for your guests to read through and bring with them when attending. All your details can fit into this suite! When your guests receive your invitation is like opening a little gift! 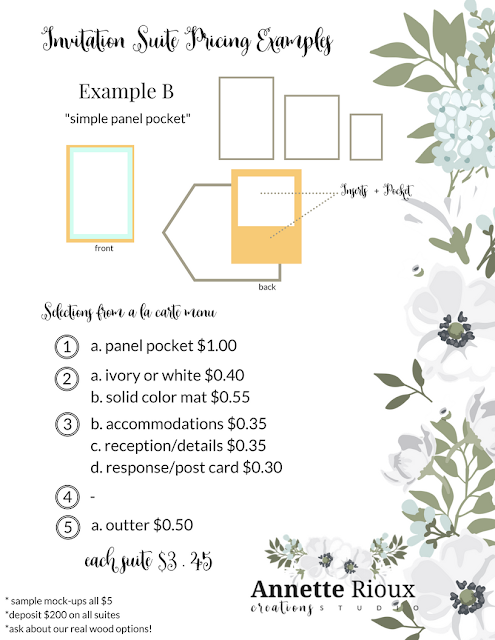 This has been one of our most popular suites because it hits a nice price point and you still get a pocket to hold all of your wedding details! Everything fits in the pocket on the back of the invite and you can still embellish this with belly bands, ribbon, twine, lace, just to name a few ideas! Convenient and elegant. 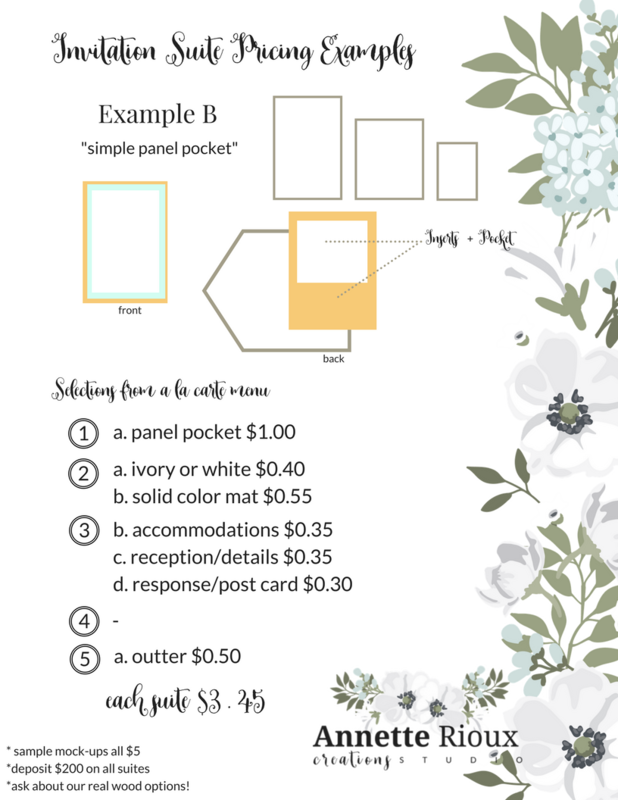 Some brides just want a beautiful custom invitation suite but want to keep their budget down. This is a great option and budget friendly. 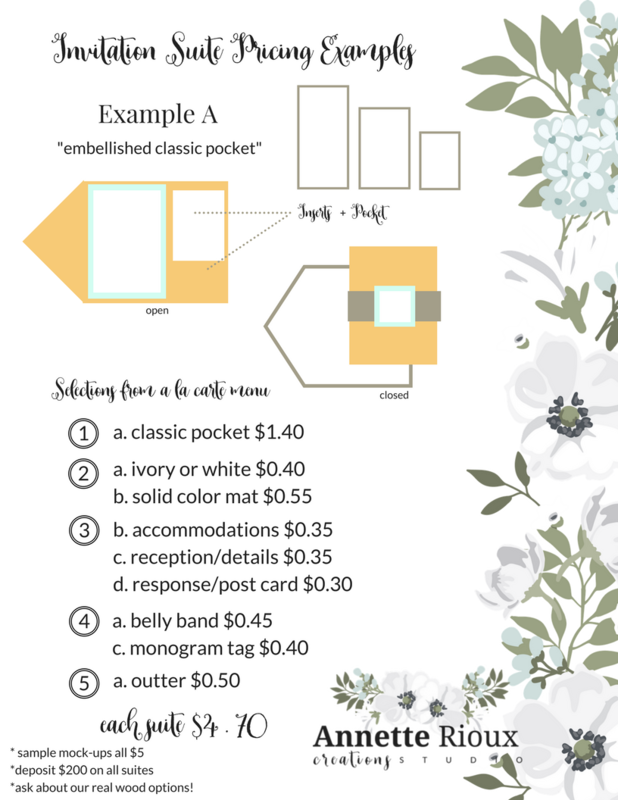 This suite is also popular it takes the pocket out but wraps all the details with a belly band and a customized monogram to showcase the upcoming wedding nuptials! Is still keeps it all tidy and easy to transport! 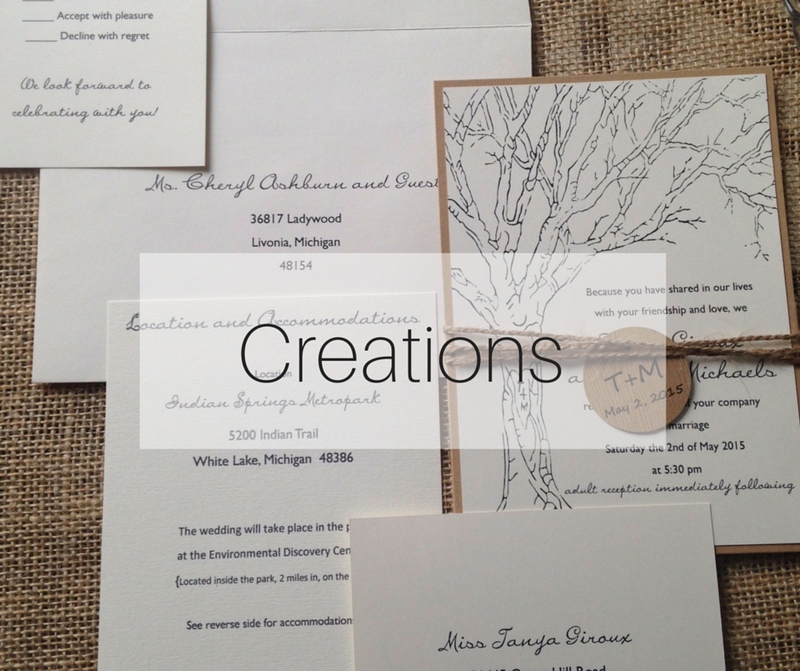 We look forward to helping you create your perfect wedding day invitation suite! Ask today for a **Free** quote! Are you someone who loves to create but have a hard time envisioning all of the details pulled together when planning a celebration?! I can help! I love details, I love planning and I love creating! 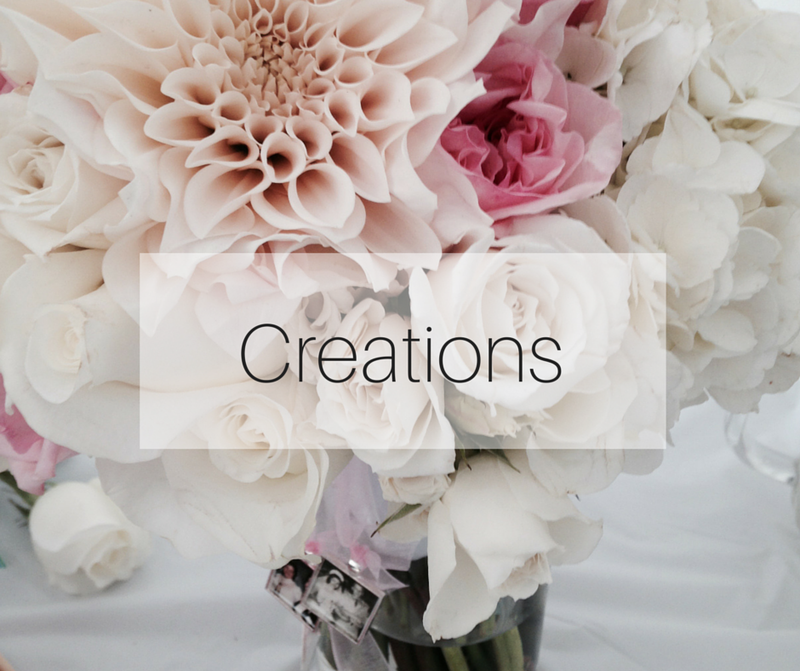 Let me create a Party Inspiration Board for your next celebration. A digital file with design inspiration and some party details can be sent to you via your inbox! 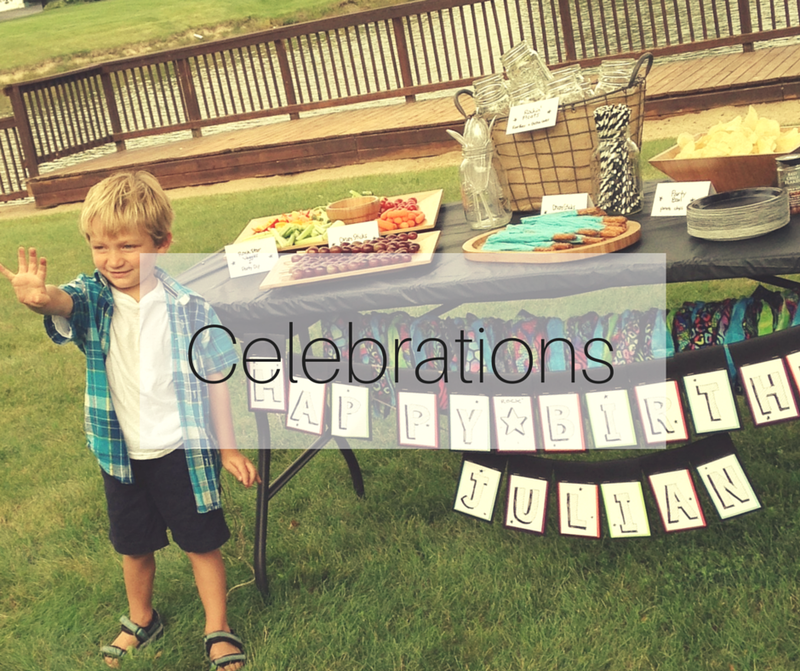 $25 for a party theme inspiration board and party table elevation with a few details! Are you planning a big event such as a wedding, a bar mitzvah or bah mitzvah, a shower, life celebration or corporate event and need a little help planning?! AC's can help you with many of the details! From figuring out quantities of tables and chairs, to laying out a detailed floor plan, to site measurements, even budgets, finding local vendors and of course the pretty details like flowers + linens! Please ask for your custom quote based on your needs! 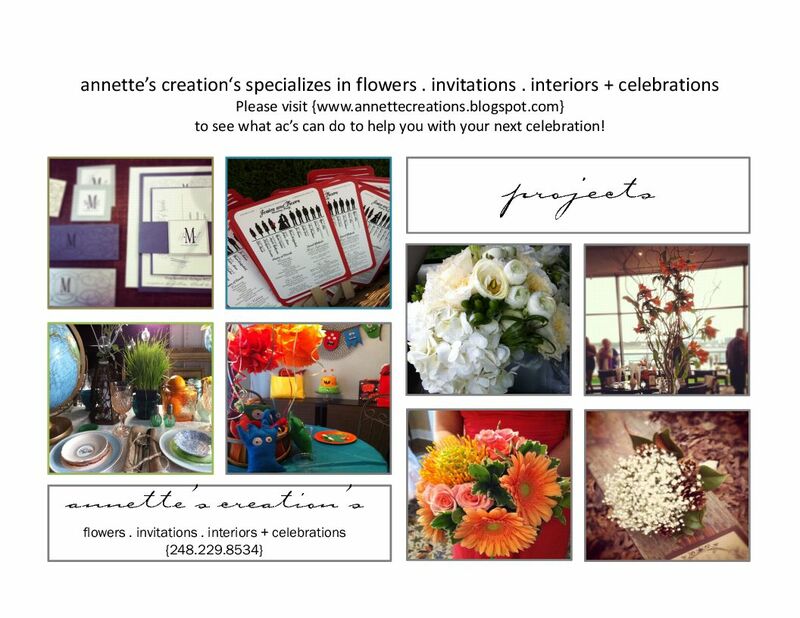 Annette's Creation's is a celebrations boutique specializing in custom invitations, flowers, celebrations, planning and design. Our mission is to inspire brides-to-be, friends, mom's planning their child's next celebration, really anyone wanting to share the love that comes with planning a celebration of life. We want to inspire you with beauty, love and fun! These elements combined in a well thought out way can make for a perfect wedding, bridal shower, birthday party, bar mitzvah, bah mitzvah, baby shower, even that golden anniversary and corporate events. And what about the holidays? I know I like to plan and be inspired when it comes to celebrating holidays too! Pretty much any gathering that involves friends, family and co-workers, planning and being well-prepared with a little extra attention to detail makes for a fabulous get-together! 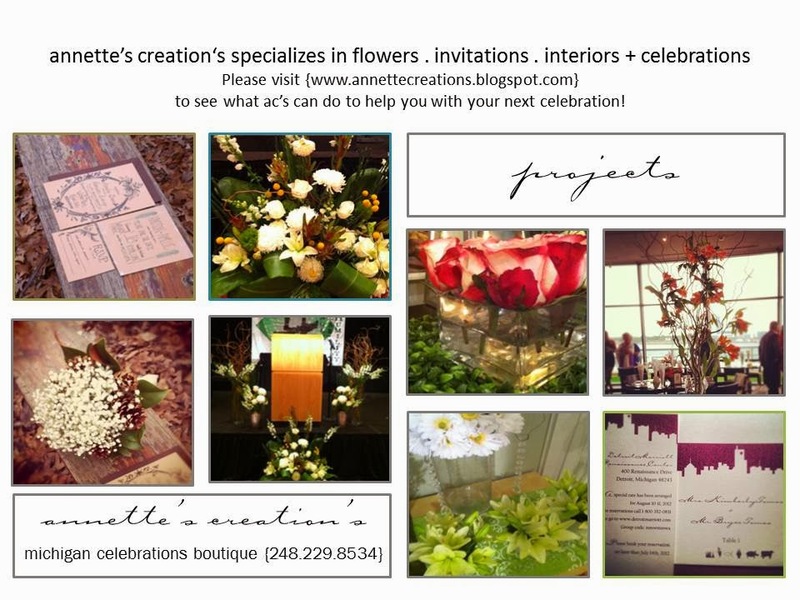 Let Annette's Creation's help you with your next celebration! We can help make your next celebration unforgettable. You provide the details, your wedding colors, and your style, we will take care of the rest! 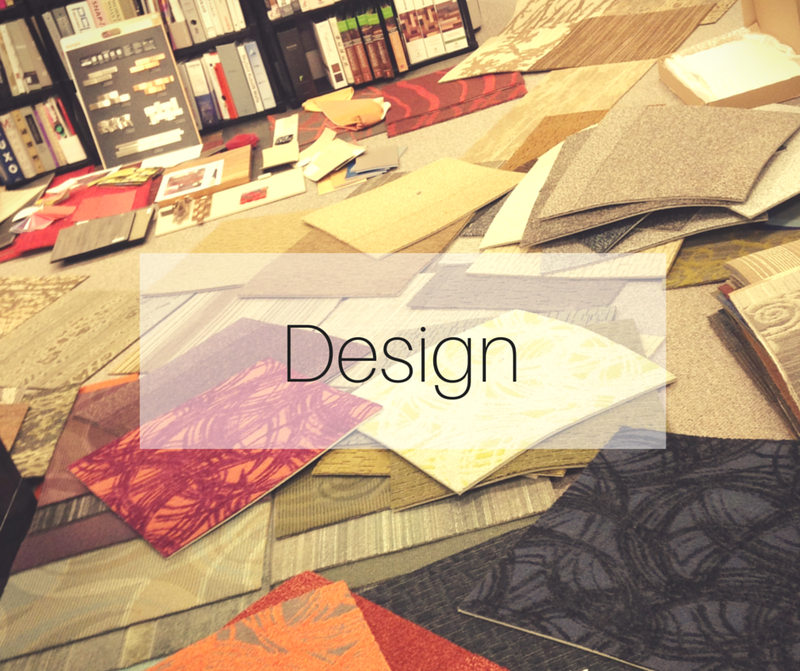 We provide design, printing, assembly and envelopes addressed ready to mail! Pockets and pocket folds start at $3.50 each. Every quote is custom and free! A little glimpse of AC's past custom invitation ensembles. Each one was customized based on the brides detail essentials. Let us know if you have any questions! 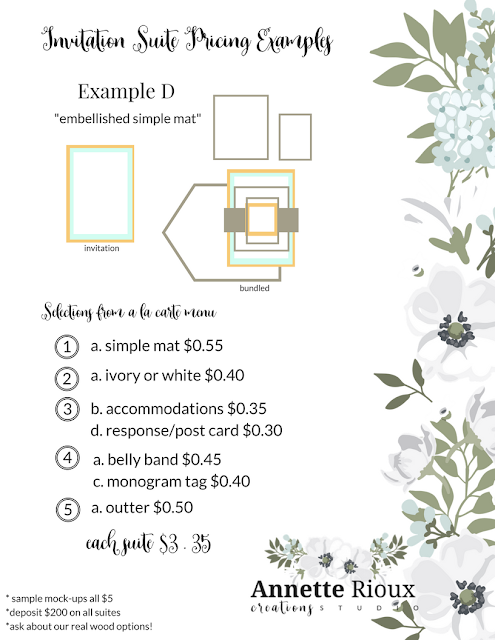 A finished panel card invitation with a belly band and monogram. The details make your wedding invitation unique and personalized. 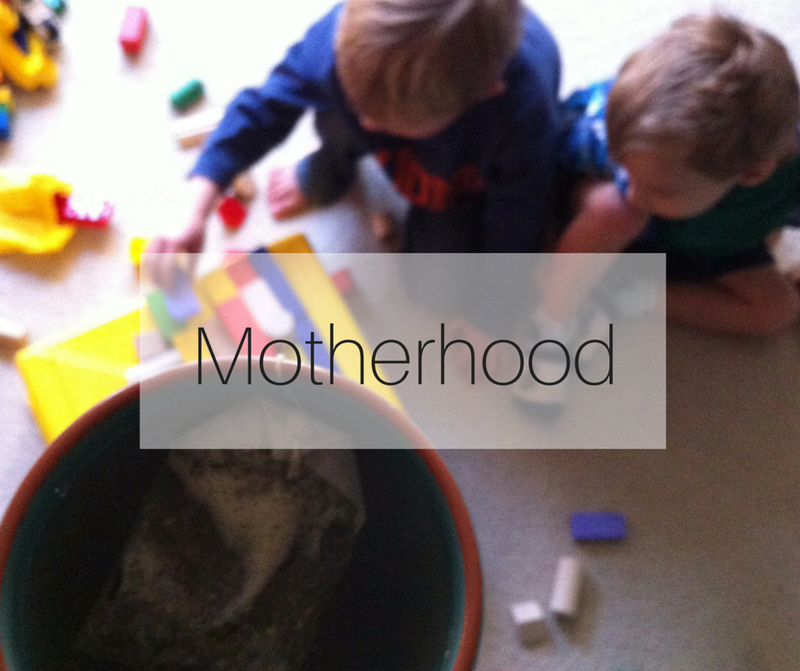 Well, I've decided to try this blog thing again! I have been busy working on projects, blog ideas, business plans, homeschool planning + just taking care of my sweet family being mom. I have been at home now a few months, the tides have changed and I have been blessed with an opportunity to focus less on design and more on celebrations! And I am so excited for whatever this universe brings me next. I know that whatever it is, it will be full of beauty in so many ways. Beautiful details, celebrations that celebrate beautiful people, + lots and lots of beautiful color, my favorite eye candy! I am excited to launch an online shop, share some party inspiration and introduce you to many local vendors who can also inspire + help you plan your next life celebration! 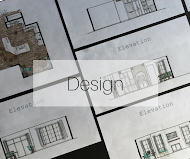 I know how important it is to show your work so that people, well, understand exactly what it is you do! I am asked all the time what it is I do, and really, I feel I can wear so many hats, the options and services ac's can provide are almost endless when you think creatively. To start to share more of what it is we can do I have put together a few photo collages. These are just simple photos taken with my iphone of recent work to help give you a little visual sprinkling of what we do. The plan is to share the professional photos taken and feature each one of these lovely events that ac's was so grateful to play a special role in.